Jamie Roberts is looking forward to playing against Cardiff Blues for the first time since leaving in 2013. 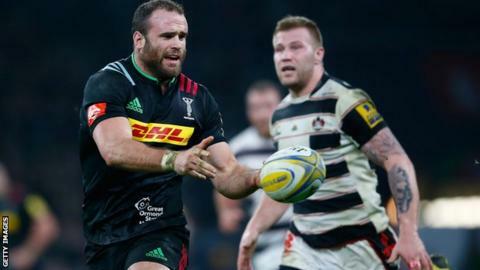 Harlequins face the Welsh region in the European Champions Cup on Sunday. The Wales and British and Irish Lions centre joined Harlequins in December after spending two seasons with Racing 92 in France. "On a personal level it will be nice to play against my old team because I've never had a chance to do that before," Roberts told BBC Radio Wales. "I'm looking forward to it. "I'll come up against players I've played with at the club and players I've played with at international level, and I'm pretty good friends with a lot of those guys and it'll be a different experience and I'm looking forward to it." Harlequins lead the Challenge Cup qualifying pool ahead of the Blues, who are nine points behind the Aviva Premiership club. They beat the Blues 32-20 in November, when Roberts did not play because he was preparing to play for Cambridge in the Varsity match. The return fixture comes two days before Wales coach Warren Gatland names his squad for the Six Nations championship, though Roberts says that will make no difference to his approach. "It's a bit of a mini trial of sorts," said Roberts. "But that's always in the back of your mind whenever you play - regardless of how close it is to the Six Nations - you're always in the shop window and never more so than in Europe. "That's the same for the Cardiff Blues boys - I know they name the squad next week - so it's about putting in a good performance and putting your hand up for selection I suppose." Sunday's match will see Roberts come up against Blues head coach Danny Wilson, who played a key role in his formative years as a junior player. "He was my first coach when I played for Rumney RFC growing up, and he's a guy I have a huge amount of respect for," added Roberts. "He's doing a good job in rebuilding that squad. He's a top bloke, and the players are responding to what he's trying to achieve on the field."